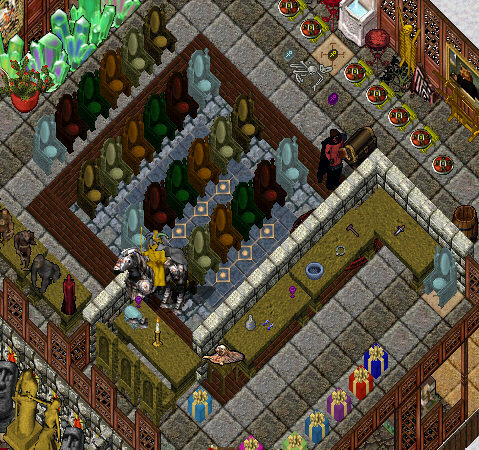 Visited by Terence Duff – Jan 7th, 2006Today I paid a visit to the NEW Shadow Hunters Empire Guild and Auction House at 113o 54’N 14o 29’E in Malas. 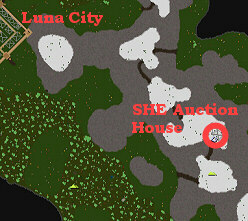 The Auction House is located in the Northern Crags mountain range just Northeast of Luna City, but on Auction Nights you can easily find one of many runes placed around Britannia. The SHE Guild has been running auctions for several months now, always on Saturday Nights and at 7:00 PM Eastern. Their new Malas Auction House replaces the original SHE Auction House near the Bog of Desolation, East of Britain. To have your item auctioned off, Zelda of Zed tells me that you must place your item in a bag with a book listing your name and starting price, and give the bag to Lady Tigerlilly behind the counter between 6:30-7:15 PM. If your item sells the Auction House takes 10% of the sale and the seller earns all the rest! Visit the SHE Auction House today and sell off that item you’ve been waiting to get rid of forever!